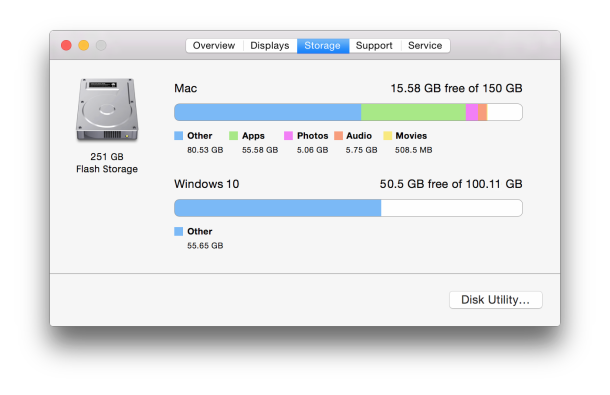 Many Mac users check the About This Mac Storage tab to get a quick overview of their disk space usage, and many will see a rather large “Other” storage space taking up disk capacity on their drives. If this sounds familiar, it’s probably because iOS often has a rather large Other storage space, but that’s largely where the similarities end, and in OS X it’s much easier to track down exactly what “Other” is. This is basically because the Mac has a user accessible file system and system directories, where as those corresponding elements in iOS are largely hidden from the user. 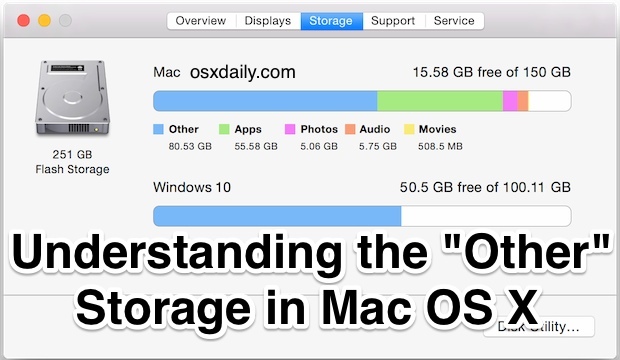 Let’s take a moment to check the Storage space on any Mac, and then learn a bit more about the Other space in OS X, what it is, and how you could reduce the size of “Other” storage on a Mac if the computer is running low on available disk space. The Other storage is the blue item in new versions of OS X, and the yellow item in the graph on prior versions of Mac OS X, regardless, Other is visible in any modern version of Mac OS X. In versions prior to OS X 10.10 you will need to click on “More Info” in the About This Mac screen to see the Storage tab, otherwise everything else is the same. The size of Other is often quite large in OS X and it varies considerably as you can see in the various screen shots here, but again, this is not something to overly concern yourself with as it could be in the iOS world. Nonetheless, it can be valuable to know what that other stuff is, particularly in the event you are running low on disk space. 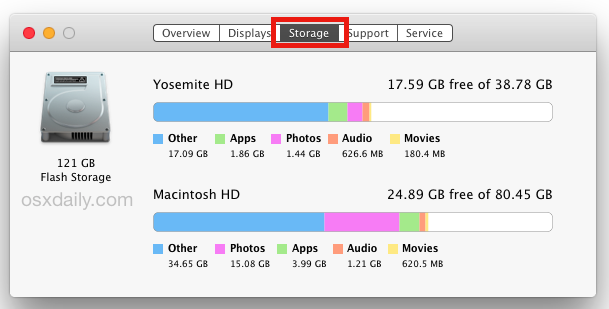 What Exactly is “Other” Storage in OS X? As you can see, this is not unnecessary junk or clutter. Basically, anything that is not one of the media types that the Storage tab specifies will be shown as “Other”. This makes the OS X “Other” storage quite a bit different from the same label applied to iOS storage, and while there can be some bloated caches and other junk, the Other storage on a Mac is more likely to make sense. This is often in contrast to the sometimes opaque and peculiar Other storage capacity in iOS, which can be anything from mishandled caches to data that is not being properly removed when apps or media is deleted, or even misallocated labels, if you happen to run into a bloated Other space on your mobile devices, you can typically reclaim and remove the Other iOS storage by deleting bloated apps, their data, and then restoring an iPhone or iPad from a backup as described here. Generally speaking, the Other storage on a Mac is not something to overly concern yourself with unless you’re running low on disk space. If you do want to try and clean up the Other storage capacity in OS X, you’ll want to look in the following locations for data and files you no longer need. As usual with deleting things in OS X, always back up your Mac with Time Machine before getting started, and do not remove items you are not uncertain of. While system files and caches are included in “Other”, you almost certainly do not want to modify the /System directory or any other root directory or system folder. What About “Other” Bloated System Caches, Temp, and System Files? To clear out OS X system level caches, temp files, virtual memory files, sleep images, and other things that could potentially count against Other storage, rebooting the Mac is often sufficient. Do not attempt to modify anything in the system folder unless you’re an expert user who knows exactly what they’re doing and why, you will otherwise almost certainly break something. If you want to, you can also use third party tools like Onyx to clear out caches safely, though it’s rarely necessary. Have any tricks of your own to free up the Other storage on the Mac or recover disk capacity in OS X? Let us know in the comments. This is fantastic. “Other” in OS X is almost always YOUR FILES! Your personal data, your personal stuff! Everything that is yours and makes your computer yours, and most of us have lots of stuff on our Macs. I think Apple should maybe relabel it, because there are many hangups from iPhone users who are used to “Other” growing to be gigantic because of some poor garbage collection in iOS. This is so hugely important to understand especially if you come from iOS where Other is always crud that hasn’t been properly cleaned up. On the Mac, Other is basically “your data”. No, unfortunately, t5his article is mostly wrong. “Other” is not mostly your files, if you mean stuff you created. Many of OS X installed files are Other. It is simply the files that do not fit OS X’s definition for Photos, Audio, Movies, Apps, and (before recent versions of OS X) Backup. For example, if you accumulate AVI movies, NONE of those are considered “Movies” by OS X, because AVI is an outmoded Microsoft proprietary format. Downloaded DMG and Zip files are “Other”. CAD projects are Other. The list goes on. Imagine a government form: “What is your race: White – Black – Other”. Well, half the world’s population is “Other”. Actually Lance there’s an entire portion of this article detailing EXACTLY what the “Other” space is in Mac OS X, I suggest you read it. The X is not precisely meant as “10”. Yes, it is the Roman numeral for 10, but it came from NeXTSTEP operating system and uniX. Apple web pages always state an OS version as “OS X v10.11” or whatever, so the X is part of the OS name. Incidentally, the OS version name has evolved through these stages: “System” (version 1.0 to 7.5.5), “Mac OS” (7.6 to 9.2.2), “Mac OS X” (Public Beta to 10.9.5), “OS X” (Notice no more “Mac” in the version name, so we might wonder what the future holds). i’ll point out that the info in the storage pane is created, at least partly, by spotlight indexing. here, an external drive is shared with large movie images, archives and a time machine backup. i have removed the disk from spotlight indexing. TM can’t be removed from spotlight indexing. the storage pane only reports the TM backup in the graph. It isn’t Spotlight indexing. Notice files from NTFS format drives are included, and unless you alter Spotlight through the Terminal, it does not index NTFS format drives. Whoops you’re right, typo left over from initially separating Yosemite and Mavericks. Fixed, thanks for pointing that out. Not sure, but I think Trash is also included. Is DIX safe on Yosemite and a Flash Storage drive? I guess I’m doing well. My 10 month old MBP retina that came preinstalled with Mavericks (and still using 10.9.5) says “Other: Zero KB”. Woo-Hoo! Good article BTW in case I ever needed. Saved it to my Readability account…. If you are using a Macbook normally use Time Machine for backups to an external drive and have Time Machine turned on but no external drive connected then Time Machine will save backups to the local hard drive until you connect your external drive. These used to be included in Other but I think they are marked as Backups in Yosemite. The backups can fill a 128gb SSD fairly quickly. Connecting the external drive will allow Time Machine to move the backups from the local drive freeing up space. Stewart is absolutely right. I thought I had been backing up to TM but the drive connector was loose! I plugged it in and 100gb reappeared on my drive, even before it was all transferred to Time Machine. Thanks Stewart! Backups is listed twice In the section What Exactly is “Other” Storage in OS X? On my Mac mini, I have an SSD as my main drive, and a partitioned 1Tb HD, One of the partitions holds my bootable backup. The SSD used memory is 100% blue. My main SSD drive has no blue storage at all. The largest bar, about 80% of the total used, is coded green. Is this because the system thinks I have a fusion drive, which I do not have? Sorry, editing problem. The previous post should have read: On my Mac mini, I have an SSD as my main drive, and a partitioned 1Tb HD, One of the partitions holds my bootable backup. The SSD used memory has no blue at all.The largest bar, about 80% of the total used, is coded green. TH HD partition with the bootable backup is all blue. I work at an Apple Premium Reseller and I saw a lot of this. We recieve lots of macbook airs with a huge cap. under “Other”. A co-worker pointed to us that if you delete your old user account and create a new one it will surprisingly be gone. of course you have to back up and move your data before that. Backups iphone or ipad in itunes ??? > Select old back ups and hits delete. Depending on how big your back ups were its an easy way to reclaim some significant data. Robert – This is great advice. I had 6 backups just sitting there and it freed up over 10 GB of space. Very surprising. Also, I noticed my trash bin had 20 GB sitting there…stupid me for not thinking of taking out the trash. Thanks. I spent a day trying to clear up the Mac with little success. Yet, within 2 minutes I reclaimed 40 GB of storage space. I’ve moved all my personal files to flash drives, wiped out all my music, movies, downloads, etc. I disabled the cache associated with Time Machine. This last move freed up over 100GB of “backup”, but everything now is in Other. So no, contrary to the comment that started this thread, other is NOT just personal stuff. I still have no idea what 833.06GB “Other” is on my 1TB drive. Did you ever get this solved? I’ve combed through my computer. I have “Other” taking up 407GB of my 500GB hard drive…. I don’t get it. And I’m a video producer, photographer, web and graphic designer – so this is hindering my work. after not too much digging around my hard drive found that i’d transferred 20GB of photos to my mac…. approx 5GB of which was .tnl and .thm files which are created when taking ‘live pictures’ (photos were taken on lumia so not sure if iphone creates same files) . anyhoo, assume the files fell into ‘other’ category which explained the high usage. oops. I posted this under iOs first by mistake. This was helpful & will continue to be. However, I bought an App called TidyUp for my 2014 Macbook Air, and it found that 200GB, yes 200! Gigs, was my “mail downloads” which I’m assuming used to be called “attachments”. Anyway, it’s been removing those files overnight, so I’m crossing my fingers I did not just delete 1,000 important files, but losing a few is fine if it means freeing up 207GB of space on an SSD that is maxed out. cheers, and best of luck. I’ll check back if I just killed my machine. Hi, I know you posted this a couple of months ago but I’m desperately trying to find out what is taking up so much space on my Mac. I currently have about 9 GB free – I just looked for the app you mentioned (Tidy Up) but can’t see it, just wondered if it did the job and if you could point me in the right direction. Thank you! Most of the Mac “cleaner” apps are scams, scareware, junkware, or worse. I would not download or recommend a random so-called cleaner app, many make things worse or hijack a computer. Think Windows crap, but on your Mac. Below are some free solutions for Mac that may be helpful. Remember that for most users the space on their Mac is taken up with the following: music, photos, movies, downloads, applications / games. Rebooting can also be helpful for cleaning out OS X system cache. Ultimately you need to learn how to look for stuff on your hard drive you can delete, or backup your pics and movies to an external drive so that you can free up space on the local drive. I’m using OS X El Capitan 10.11.3. There is no heading for ‘Other’ in the graph, only Apps, Photos,Audio, Movies and Backup (although I haven’t got anything in this last one because I save to a Time Capsule). I’ve used 330 GB out of 499 GB, so there must be plenty of ‘Other’ somewhere. Any ideas as to where will I find it, please? I am also using 0SX El Capitan 10.11.3 and can find no heading for ‘Other’, it is all in the Apps, and I seem to be adding to this at about 2Gb daily. I have no idea how to reduce this figure. Adding the totals shown in the headings shows a total of almost 20Gb more than the HD total does anyone know how to reduce this? I have been trawling the internet for days trying to find out how i can fix my problem. I followed the instructions here to remove about 200gb of movies . I trashed and restarted. When I restarted the movies now seem to be in “other.” How do I get rid of them ?? Empty your Trash. If the movies are sitting in your trash can you need to empty the trash for them to delete. Apple software is also pretty half-baked, don’t be surprised if things are erroneously assigned to Other it happens all the time on iPhone. Use “Get Info” (file menu) on Macintosh HD to find out how much space you really have available. Actually even though other shows a massive increase in storage I can’t find these files in Other. I have a a bit of an aversion to loading other apps when Macs normally look after themselves. While taking someone else’s advice of cleaning out my folders, I found videos in my quick time player that I didn’t knowingly put there. I guess the app keeps a copy of everything I played using that app? After deleting those I had 200 GB. It’s worth a look. Im running Yosemite on a late 2014 iMac 27 i have a 1tb fusion drive and i had 900 gb free about a week ago, fast forward today and im getting Startup disk low error messages. I freed up about 20 gig from my downloads folder and after restarted my computer the drive says disk full once again. I repeated the deleting process til i removed about 70 gigs of data, and every time it resets to 0 free space. When i check storage usage it shows me 1tb in Other, and i cant account for any of these files. Have read all above and followed all the advice. I still have approx 120GB “other” which I cannot find any reason for. Tried Omnidisksweeper and it just finds the same as I do using apple’s “get info” – 69GB which I can fully account for – it didn’t see “other” at all. Have searched file system by size, app, downloads, docs, movies and everything else I can think of. Anyone any ideas? Hardware is old 2008 iMac, 250GB drive, 4 GB memory running latest level of El Cap. Have you tried rebooting the Mac? The “Other” space can sometimes be caches, virtual memory swap files, local time machine backups, and other weird crud that shouldn’t be around and it gets cleared on rebooting. Also sometimes “Other” is erroneously reported, is there a discrepancy in disk storage available and disk space used? Often the “Other” space on a Mac is simply system files and the aforementioned caches. Thanks Jory. Mac rebooted regularly and no change. All the disc usage/free numbers from whatever source tally with no obvious discrepancies. OmniDiskSweeper just confirmed what I had already determined – will try DaisyDisk but think it will tell the same. 120GB seems a lot of system files given by macbook has only 11GB. Something still doesn’t seem right. Hi – I’m curious as my iMac has a 1TB internal HD which claims to have 350GB of ‘other’ content. This is obviously very high… Any thoughts? Does this include system and OS X content? Or are ‘apps’ all my stored programmes such as Safari etc? If all you geeks can’t solve the yellow ‘other’ problem, what hope have I? – I don’t even know what a cache is! According to my experience, other is just your stuff. I deleted a bunch of old Zbrush files and it cleared it right up (after a restart). Just store your bigger files on a drive or something and you’ll be golden. Cache, it’s short for “crap all web sites you visit hook into your computer to remember you with.” These files pull on your os and thus reduce its ability to respond like lightning and carry greater loads. Your trusted web sites like banking are ok but non essentials will be like an ant hill if you don’t clear them from time to time. Hey not knowing yellow from blue isn’t as bad as green from red :)! I noticed the phenomenon of disappearing hard drive space. I deleted extraneous stuff, and free space kept getting smaller. I found this article, noticing it’s 3 years old. Checked the STORAGE tab, and no OTHER was showing. I used a 3rd party app called DiskDaisy, which if you run it in Admin mode, shows you something called Hidden or Purgeable Space—Time Machine cache files. It showed that I had more than 120 gigs of stuff in there!! I deleted it through DiskDaisy, and now I’ve got my space back. I wouldn’t have known that’s what was going on without DiskDaisy—wondering if there was something in OSX that I missed that would have showed me the same thing.